The market was full of Provo short sales and bank foreclosures. In fact, between 2007-2011 about 50% of the homes were distressed properties. However, at the begining of 2012 the Provo Utah Market started moving again and prices started increasing thru 2013 to 2016. Paul Teasdale the principal broker of Team Teasdale Realty makes regular youtube videos about the current Provo Utah Market. This video is very relevant to the Provo Utah Real Estate Market. I encourage you to watch it and familiarize yourself with the current direction of the Lehi market. If you have specific questions about the real estate market feel free to contact Paul Teasdale directly. The number of homes sold in Provo Utah in the 1st Quarter of 2011 was 146 compared to 138 in 2012. The Average price went from $191,078 in 2011 to $190,197 in 2012. This was a slight decline. However, in the second quarter the data has slightly changed. We had 195 homes sell in the 2nd quarter of 2011 compared to 219 in the 2nd quarter of 2012. This was an increase of 24 homes sold in Provo Utah in the 2nd quarter of 2012. The average price slightly decreased from $205,588 in 2011 to $190,187 in 2012. If you compare these numbers to 2009 and 2010 you will see an increase in units sold. Provo Utah had 96 homes sell in the first quarter of 2009, 140 in 2010, 146 in 2011 and 138 in 2012. The average price has been declining over the past few years but it is currently stable. In my opinion the average price and homes sold will increase over the next 12 months. Many buyers are returning to the market. It is interesting to see homes that were listed and didn’t sell in 2011 come back to the market at higher prices. The general feeling amongst buyers and sellers is that prices and demand is increasing in the Provo Utah Real Estate Market. The graph above represents all homes sold in Provo over the past 6 years. This data includes residential homes for sale, condos, townhomes, twinhomes. It excludes lots and commercial properties. This data is compiles by the Utah County Association of Realtors and does not include for sale by owner homes sold. Are you looking for more information about the Provo Utah Market? Contact Paul Teasdale. The number of listings in Provo Utah is declining along with the number of homes for sale in Utah County. The number of homes for sale in Utah County has dropped to a staggering 2978 homes for sale. We are seeing less condos, duplexes, single family homes and twin homes for sale in Provo Utah. The Provo Utah Real Estate Market continues to change. This is the lowest level of homes for sale in over five years. The chart below represents the number of active homes for sale each month in Utah County over the past five years. Notice the purple line. This is the number of homes available in 2011. This line has been sharply charting down. Buyers are buying because of low interest rates, amazing deals on bank repos, hud homes and short sales. Many of the best buys are gone and the market is starting to show some life after five years of being pounded. If you are looking to buy a home in Provo and are looking for a Realtor consider contacting Paul Teasdale of Team Teasdale Realty. Feel free to search our database of homes for sale in Provo Utah. This database is a live feed from the Realtors MLS and has all 314 homes for sale in Provo Utah. You will also be able to search all 2978 homes for sale in Utah County. 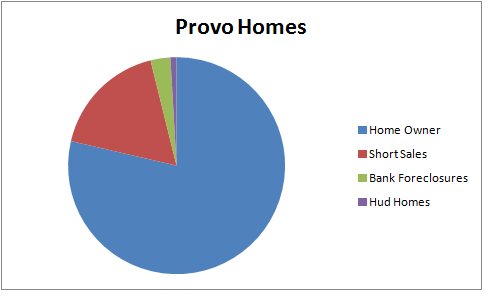 Provo Utah had 644 homes, condos, townhomes and twinhomes SOLD in 2011. These homes consisted of Bank Foreclosures in Provo Utah, Short Sales, HUD Homes, Fannie Mae and Freddie Mac Homes. Bank Foreclosures in Provo Utah continue to rise. The 644 homes included the typical residential seller in Provo that was not experiencing a distressed situation. Approximately, 25% of the homes sold in Provo were short sales in 2011. I have crunched some numbers to see how the foreclosures in Utah County compare to one another. The most stable city is Orem and the least stable is Springville. Provo is relatively stable compared to the other cities in Utah County. Saratoga Springs and Eagle Mountain had a higher percentage of bank foreclosures. I have not been able to find any condos located next to BYU that have experienced a short sale or bank foreclosure. These condos seem to keep their values due to the demand. It is hard to imagine that half of the homes sold in Provo, Utah were either bank foreclosures and short sales. 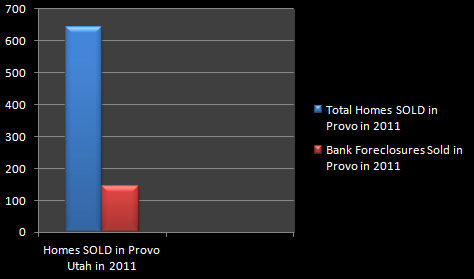 The amount of bank foreclosures in Provo Utah and shorts sales will continue into 2012. In speaking with many of the Realtors that represent the banks in Utah County they have made it clear the inventory will continue. If the supply of bank foreclosures and short sales continue into 2012 then may experience a continued price decline into the future. Find the homes that are the most comparable to your home. Team Teasdale Realty will provide you with a FREE CMA on your homes value. When selling a seller should price a home in Provo Utah correctly. If you have questions about the current Provo Utah Real Estate market contact Team Teasdale Realty. The selling prices of pending sales in Provo are unknown; until such time that the transaction deal is closed and sold. Be wary of the number of days in the market, for this may have a direct impact on how long it could take before you will see an offer for such home. Look at the history of the home listings in Provo UT to figure out the price reductions. Paul Teasdale has been selling homes in Provo Utah since 1995 and would be happy to take a look at your home and help you determine the value. Request a FREE comparative market analysis of your home for sale in Provo UT. Feel free to review our marketing plan to sell a home in Provo, Utah. To Price a Home in Provo Utah contact Team Teasdale Realty.